There is no question that children bring the true spark to this season. Seeing our wide-eyed children light up when they see Christmas lights or grin ear to ear at the idea of visiting Santa . . . those are the memories I will never forget. Of course Santa will spoil children this season, but in case you want to pick up a gift or two I have curated my very favorite gift ideas. Many of these are toys we still have in this house and have truly lasted for years. I like toys that encourage creativity, imagination or physical activity. 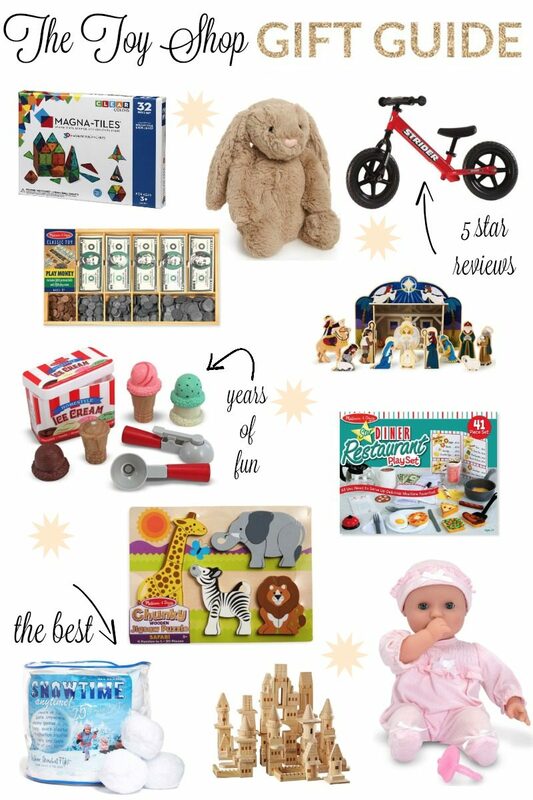 Here is The Toy Shop Gift Guide! Far and away one of the most popular gifts ever received in our home. A friend had recommended these to me years ago. We have two sets and the kids still pull them out from time to time. Anything that inspires building is a homerun in my book. These are also compact enough that you can toss them in a bin and take them with you to Grandma’s house. I also pull these out anytime friends with younger children visit and they always have so much fun for such a long period of time. Highly recommend. I mean! This cutie makes my list every year. If you have a young one to buy for, you can’t go wrong with this. It’s so soft and will stand the test of time. My kids just missed the window on these but these bikes receive perfect reviews and our friends that have had them sing their praises as the way to teach children how to balance on a bike. And who doesn’t love a bike under the tree. I STILL remember getting my blue ten-speed under the tree when I was 10. I’ll never forget that. We have had this for years. It’s a set that not only teachers children about money, but it grows with them. I can remember hours of “grocery” time where they kids put a price on all of our food and we went shopping using the exact amount of money. While we have a beautiful nativity that sits on a table during the holidays, we’ve always had another one that the children can interact with and use. This one is classic and timeless. I still get served ice cream to this day. This might be one of my favorite Melissa & Doug products. Although I really love all of their toys. This comes with mint chip ice cream so how can you turn that down? If your children are anything like mine, they will play some sort of restaurant for years. We’ve been treated to “date-nights” on the carpet with appetizers, dinner and dessert. We are always offered the best table in the house. Needless to say, we still have a bin of restaurant food that I will never part with. I adore the creativity that stems from this type of play. We still have a puzzle just like this from when I was little. We have about ten and I keep them for when little ones come to play. My children played with them and I can’t wait to see their babies use them in the future. You can’t beat the quality of a wooden puzzle and they are so great for brain development. These were under the tree for our kids last year. SO MUCH FUN! We immediately had snowball fights (they are so soft and can’t hurt anyone) and tossing competitions. We still use one as a hockey puck when my son wants to play in the house. I once read somewhere that it is really good for children to be able to throw things and get out their aggression (they don’t even know they have it) and these are so awesome for that. The set comes with a list of games that can be played but of course the kids will come up with a million more. While we have never had castle blocks, I fell in love with this set. A little bit more exciting than a usual set of blocks and love the intricate detail. Hours of fun, here. Pretty hard to resist a darling babydoll. This has always been my favorite. I think it’s much easier to shop for children when they are quite young. Heck, they are most happy with the box the toy arrives in, am I right?! But as they grow older, it can be a bit more challenging. Interests emerge and opinions kick in. So these are toys I’ve seen my children play with for the long haul. They might not play with them every day, but they re-emerge consistently and I see them come out when friends come to visit, too. This family loves this game. We have the original but I am sure my children would love getting this version. This game is complicated to learn but so worth it. It encourages using strategy and thinking ahead. Can’t say enough about this. Always hard to find a game that actually challenges every age level and this is it. It gives us a run for our money. Great game! These were under the tree for my daughter one year and she will still bring them out and build. A great way to learn the basics of how circuits work and so awesome for encouraging young people to love science. They come with a ton of activity cards and instructions on how to different combinations including making a buzzer and a fan. Two thumbs up from this family. This is a fancy set that my daughter would flip for but I also love this set. My parents gifted her with a similar set a few years back and she was just creating with it a couple of days ago. Priceless to let kids draw and design all on their own. The more you kick it, the more it lights up. So fun for the older kids to go out and play in the evening. Love this idea. I want to try it myself. LOVE. You need this game. I mean your child needs this game. LOL. We love this game and every age group enjoys playing it. Big hit around here! If you have carpet, this disk rocks! In our previous home we had a large play room with carpet. We used this so much. It’s really a genius idea and a great way to play with a ball in the house. So this is just like the set I spoke about above. We love these. This is this year’s version. They glow in the dark which is just so much fun. All kids love things that glow in the dark, don’t they?! I can imagine turning of the lights with my kiddos and having tossing contests with these. Something different and out of the box. I would be remiss if I didn’t mention this ice cream truck. My mom and I were shopping and stumbled upon it. Have you seen it? I immediately called my girlfriend who has a five-year old and said it needs to happen so we can all play with it! LOL. She said it was already on her list so I am not so secretly hoping Santa delivers. It is the CUTEST! The photos don’t do it justice. I hope this gift guide is helpful when thinking about all of those sweet kiddos in your life. How is your shopping coming along? I’ve checked a few things off of my list but I need to step it up if I am going to try to get most of it done this month. Off to tackle some organizing and cleaning. Hosting next week and with the kids off from school I’d like to get some things accomplished before they are out. Make it a great day, my friends. Design by Sydnee | A Lifestyle Blog ???? I’m so happy to hear that, Sydnee. Isn’t true that it gets a little bit harder as they grow up. Such fun things out there but it’s not always easy. Enjoy this fun time of year with your family. THANK YOU!!! Definitely a much-needed post for this mama! Thank you! I love some of these ideas for older kids, who are definitely harder to shop for. I might have to get that Codename game for myself! Ditto the ice cream cone set – my kids love it! Great ideas! My 9 year old son loves throwing snow balls in our home- the only ball he is allowed to play with in the house! He will go crazy over the glow in the dark ones! Thank you for these helpful suggestions! It’s hard to buy toys for older kids because they are so technology driven these days…sigh! I love the games suggestions- my kids are 8,9 and 13 and it’s hard to find something we can all play together! 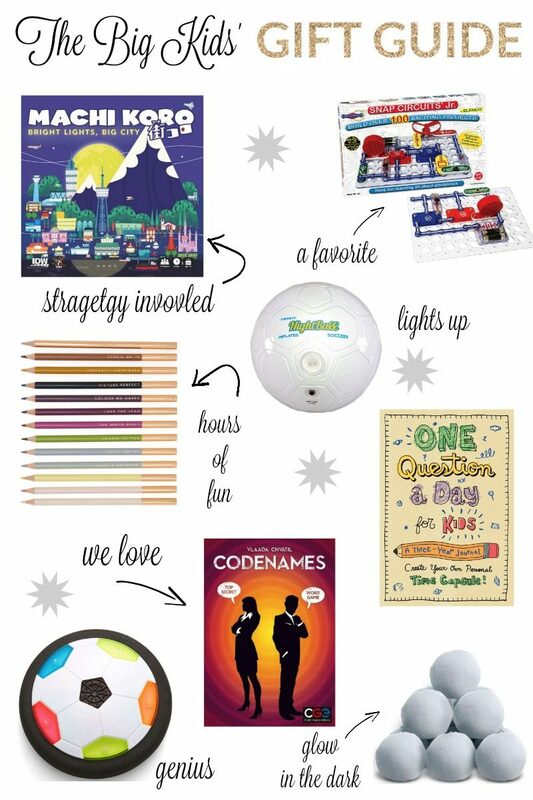 The snowballs and snap circuits sound so fun, will be putting those on my list! My daughter got the ice cream truck for her birthday this summer and it is so stinking cute! Lots of fun little details! Thanks for the post Courtney, such great ideas! Magnatiles are absolutely the best toy my kids have ever had – everyone loves playing with them! I’m definitely looking into buying the snow balls and snap circuits – I’m in Australia so will have to see where I can get them from here since shipping from the US can be a bit much.